As part of an ongoing series, we hope to feature some stories and people that speak to the spirit of the DannyShane brand. This month, we have decided to kick off this project with our own founder and CEO, Shane Hunt. We would absolutely welcome your stories of unique adventures on the bike. In case you missed Part I of the Heart of DannyShane, you can see it on our blog. As always, don't forget to visit the site and see what is new at DannyShane.com. Austin has such a vibrant cycling community. How does it influence what you are doing at DannyShane? ShaneHunt: I was born and raised in Texas. I grew up on a working ranch in Eastland County,TX. [We had] pigs, cattle, peanuts, a pecan orchard – it was a colorful life. Whatever we made, we sold. We sold to local grocery stores and peddled peaches beside the interstate – a pickup truck with a sign on the side of the road. I found out early on that if I believed in what I was selling, I could sell it. We spent days selling peaches, moving irrigation pipe, working in the peanut field, but it never felt like work. It was more adventure than work. My dad passed away when I was young. My brother and I moved to near Cisco, TX to live with my grandparents. That gave us an introduction to music. I learned guitar, brother Zach the banjo, and my cousin Jeff the piano. We toured in central TX, playing small venues. I found that even while being a musician, if you are creatively oriented, then you have those creative skills. Even then, I was waiting for my chance in life to do something creative. I’ve been CEO of a few companies since, but DannyShane is now the outlet to use that creativity, so much of which has been influenced by my Texas roots... And Austin, of course, is an amazing city, too. We love the story about flying 36 hours on an airplane in a DannyShane shirt. Shane Hunt: I met David Love, CEO of PaliGap, a hard and soft goods distributor in the UK, at Interbike a few years back. He noticed our Bridge Polo. He called it beautiful and interesting. I could tell he was a size medium, so I took it right off the mannequin and gave it to him. He flew out of Las Vegas back to Bristol later that day. It is like a 1.5 day trip. Shortly after, he sent me an email thanking me for the polo. He said he slept during most of his travels in that Bridge Polo – it was very comfortable. He said when he stepped off the plane, the polo didn’t smell bad, didn’t look bad, and had no wrinkles. He got off the plane, after 36 hours, looking and feeling fresh as if he just stepped out of the house. I realized then that even cyclists occasionally like to look like a million bucks! Now, I use the story all the time to talk about the benefits of our bamboo fabric which is, actually, quite amazing. Shane Hunt: My current bike is an FP3 Pinarello. It is a classic. It is a few years old. I was lucky to find something timeless when I bought it from a racer on the Team San Jose cycling team. The bike was a perfect fit. I have had it for five years. I have descended and hit 60 mph on it. I rode it on a five-day, 523 mile trip from Amarillo to Crested Butte with seven other guys. Riding through Taos and Wolf Creek Pass, we climbed over 35,000 vertical feet in those five days. We would hit 50-60 mph on those descents. I could spend some money and get a lighter model. But, I'm loyal to this machine, so it will be my bike for a while. It even has the DannyShane colors, so it's easy to coordinate with our designs. Shane Hunt: My pleasure. I'm always glad to talk about the brand and look forward to hearing updates from our customers each day on Instagram, Twitter, and the like... so keep 'em headed our way with #DannyShane. Got a great story to share? We'd love to hear it. Email us at cary@dannyshane.com. 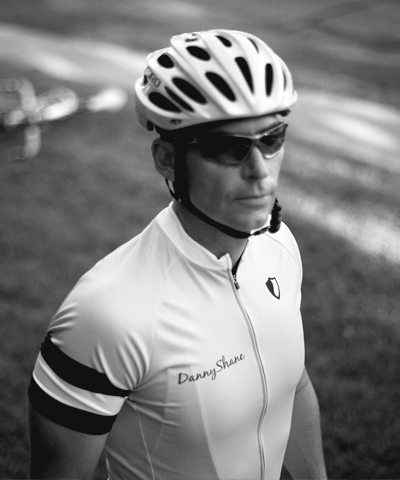 If your story is selected, you can count on the opportunity to grab a free DannyShane jersey.